Asian tuntija sanoi, että "piireissä" sitä nimitetään taika-tatiksi. Mun pitikin linkata tuohon. Kuuntelin. Ihan ok, itseäni kiinnostaa ruokasienien metsästäminen. Oli muuten asiantuntijoita studiossa, kun siellä tunnistettiin sieniä ihan sanallisista kuvauksista ilman kuvia. Ylen aamutv: Hilkka Huttunen Uudenmaan Martoista antoi vinkkejä sienestämiseen. Laitoin linkin uusiks kun entinen oli vanhentunut. Psilocybin (4-phosphoryloxy-N,N-dimethyltryptamine) is the major psychoactive alkaloid of some species of mushrooms distributed worldwide. These mushrooms represent a growing problem regarding hallucinogenic drug abuse. Despite its experimental medical use in the 1960s, only very few pharmacological data about psilocybin were known until recently. Because of its still growing capacity for abuse and the widely dispersed data this review presents all the available pharmacological data about psilocybin. The spread of activation in semantic networks can be measured using semantic and indirect semantic priming effects in lexical decision tasks (Spitzer et al 1993a and b). For example, in thought-disordered schizophrenic patients, activation spreads faster and farther than in non-thought-disordered patients and normal subjects, which results in an increased direct and indirect semantic priming effect (see below). This has been interpreted as the result of a decreased signal-to-noise ratio in cortical neural networks that process semantic information. Such a decreased signal-to-noise ratio has been related to a decreased dopaminergic modulation (Servan-Schreiber et al. 1990; Cohen and Servan- Schreiber 1992, 1993), which we recently were able to confirm directly in a study on the effects of L-dopa on semantic and indirect semantic priming (Kischka et al 1995). As dopamine was found to have a focusing effect on the activity in semantic networks, i.e., it increases the signal-to-noise ratio and reduces the spread of activation (measured as reduced indirect semantic priming), we set out to investigate the effect of the hallucinogenic agent psilocybin on this task. Since psilocybin is known to act on the serotonin (5-HT) system and has effects of "broadening" conscious experiences, we hypothesized that it might exert a defocusing effect on semantic networks (i.e., decrease the signal-to-noise ratio), which should lead to an increased indirect semantic priming effect. To test this hypothesis directly, we conducted a double-blind, placebo-controlled study on the effects of psilocybin on semantic and indirect semantic priming as part of a larger project that was designed to assess the behavioral effects and pharmacokinetic properties of this hallucinogenic agent (the results will be reported elsewhere; cf. Holzmann 1995). RATIONALE: Binocular rivalry occurs when different images are simultaneously presented to each eye. During continual viewing of this stimulus, the observer will experience repeated switches between visual awareness of the two images. Previous studies have suggested that a slow rate of perceptual switching may be associated with clinical and drug-induced psychosis. OBJECTIVES: The objective of the study was to explore the proposed relationship between binocular rivalry switch rate and subjective changes in psychological state associated with 5-HT2A receptor activation. MATERIALS AND METHODS: This study used psilocybin, the hallucinogen found naturally in Psilocybe mushrooms that had previously been found to induce psychosis-like symptoms via the 5-HT2A receptor. The effects of psilocybin (215 microg/kg) were considered alone and after pretreatment with the selective 5-HT2A antagonist ketanserin (50 mg) in ten healthy human subjects. RESULTS: Psilocybin significantly reduced the rate of binocular rivalry switching and increased the proportion of transitional/mixed percept experience. Pretreatment with ketanserin blocked the majority of psilocybin's "positive" psychosis-like hallucinogenic symptoms. However, ketanserin had no influence on either the psilocybin-induced slowing of binocular rivalry or the drug's "negative-type symptoms" associated with reduced arousal and vigilance. CONCLUSIONS: Together, these findings link changes in binocular rivalry switching rate to subjective levels of arousal and attention. In addition, it suggests that psilocybin's effect on binocular rivalry is unlikely to be mediated by the 5-HT2A receptor. 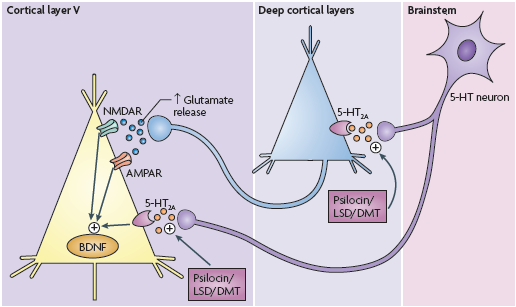 Background: Recent findings suggest that the serotonergic system and particularly the 5-HT2A/1A receptors are implicated in visual processing and possibly the pathophysiology of visual disturbances including hallucinations in schizophrenia and Parkinson's disease. Methods: To investigate the role of 5-HT2A/1A receptors in visual processing the effect of the hallucinogenic 5-HT2A/1A agonist psilocybin (125 and 250 μg/kg vs. placebo) on the spatiotemporal dynamics of modal object completion was assessed in normal volunteers (n = 17) using visual evoked potential recordings in conjunction with topographic-mapping and source analysis. These effects were then considered in relation to the subjective intensity of psilocybin-induced visual hallucinations quantified by psychometric measurement. Results: Psilocybin dose-dependently decreased the N170 and, in contrast, slightly enhanced the P1 component selectively over occipital electrode sites. The decrease of the N170 was most apparent during the processing of incomplete object figures. Moreover, during the time period of the N170, the overall reduction of the activation in the right extrastriate and posterior parietal areas correlated positively with the intensity of visual hallucinations. Conclusions: These results suggest a central role of the 5-HT2A/1A-receptors in the modulation of visual processing. Specifically, a reduced N170 component was identified as potentially reflecting a key process of 5-HT2A/1A receptor–mediated visual hallucinations and aberrant modal object completion potential. The use of hallucinogenic fungi containing psilocybin and or psilocin has, during the past few decades, spread from Central America to the whole western world. Psilocybin (4-phosphoryloxy- N, N-dimethyltryptamine) and psilocin (4-hydroxy-N,N-dimethyltryptamine) were first isolated from Psilocybe mexicana but have later been reported from more than 30 species of the genus and from several species of other genera. In the Scandinavian countries, the most common psilocybin-containing fungus is Psilocybe semilancuta; in all, about ten active species have been reported from Norway and Denmark. In this study, a variety of Finnish fungi were screened for their psilocybin and psilocin content using two methods of hplc. Background: This research focuses on the events leading to the 1968 U.S. federal prohibition of psilocybin. It is a study of duelling moral entrepreneurs—Timothy Leary and Richard Alpert vs. the Harvard University Administration. The goal is to show how the primary active compound in an ostensibly harmless fungus (the psilocybin mushroom) became controversial in less than a decade. Methods: We used books, newspapers, magazine articles and previously unpublished materials (including documents from the Harvard Archives) to analyze Leary and Alpert's lives and careers through the early 1970s. Results: The prohibition of psilocybin in the U.S. was largely a product of Leary and Alpert's involvement in the “Harvard drug scandal” and their transformation from Harvard professors to countercultural icons. They tested the substance on a variety of human subjects and in doing so piqued the interest of Harvard undergraduates while drawing condemnation from other faculty and Harvard administrators. This case is theoretically interesting because unlike most illegal drugs, psilocybin was never linked to a threatening minority group, but to some of the nation's most privileged youth. Conclusion: The Harvard administrators were not really moral entrepreneurs but Leary and Alpert clearly were. Although they were far from being prohibitionists, they were self-righteous crusaders on different but equally holy missions for the good of young and minority Americans. Ironically, due to their successes the possession of psilocybin was criminalized under United States federal law in 1968 (Pub. L. No. 90-639, Stat. 1361 1968 and Boire, 2002). This case study demonstrates that crusaders can be successful in changing culture even when laws are passed in futile attempts to control their behaviour, just as Leary predicted. RATIONALE: This dose-effect study extends previous observations showing that psilocybin can occasion mystical-type experiences having persisting positive effects on attitudes, mood, and behavior. OBJECTIVES: This double-blind study evaluated psilocybin (0, 5, 10, 20, 30 mg/70 kg, p.o.) administered under supportive conditions. METHODS: Participants were 18 adults (17 hallucinogen-naïve). Five 8-h sessions were conducted individually for each participant at 1-month intervals. Participants were randomized to receive the four active doses in either ascending or descending order (nine participants each). Placebo was scheduled quasi-randomly. During sessions, volunteers used eyeshades and were instructed to direct their attention inward. Volunteers completed questionnaires assessing effects immediately after and 1 month after each session, and at 14 months follow-up. RESULTS: Psilocybin produced acute perceptual and subjective effects including, at 20 and/or 30 mg/70 kg, extreme anxiety/fear (39% of volunteers) and/or mystical-type experience (72% of volunteers). One month after sessions at the two highest doses, volunteers rated the psilocybin experience as having substantial personal and spiritual significance, and attributed to the experience sustained positive changes in attitudes, mood, and behavior, with the ascending dose sequence showing greater positive effects. At 14 months, ratings were undiminished and were consistent with changes rated by community observers. Both the acute and persisting effects of psilocybin were generally a monotonically increasing function of dose, with the lowest dose showing significant effects. CONCLUSIONS: Under supportive conditions, 20 and 30 mg/70 kg psilocybin occasioned mystical-type experiences having persisting positive effects on attitudes, mood, and behavior. Implications for therapeutic trials are discussed. The Selva Pascuala mural, a work of post-Paleolithic rock art in Spain, contains fungoid figures herein hypothesized to depict neurotropic fungi, especially Psilocybe hispanica, a species that occurs in a neighboring region. This hypothesis is based on features of these figures related to fungal morphology, along with ethnographic analogy, and shamanistic explanations of rock art. If correct, this interpretation would support inference of prehistoric utilization of this fungus in the region. The mural represents the first direct evidence for possible ritual use of Psilocybe in prehistoric Europe. Pari Jochen Gartzin laatimaa massiivista artikkelia jäi kuitenkin pois, koska gallerian tiedostokokorajoitukset tuli vastaan. Voiskohan noita limittejä suurentaa väliaikaisesti? Noi paprut on kuitenkin ihan päteviä, kun toisessa käsitellään suippumadonlakin kasvattamista ja toisessa listataan Suomessa kasvavat psykoaktiiviset sienet. Herjaa myös, että "Tiedosto on liian suuri latausten kokonaisosuudellesi." Lisäks tuossa luettelonäkymässä tiedostonimien näyttö katkeaa ensimmäisen pilkun kohdalla, mikä tuntuu toimimattomalta. No, nyt on gallerian limitit pushattu Matyaksen toimesta. In this paper, the world distribution of 216 known species of neurotropic fungi is discussed. The neurotropic fungi considered are divided into the following four groups: 1) species with psilocybin and related indoles, or those likely to contain these substances, 2) species with ibotenic acid, 3) ergot fungi, and 4) species used as sacred fungi for which no reliable chemical studies have been found. In the first group are Psilocybe (116 species), Gymnopilus (14 species), Panaeolus (13 species), Copelandia (12 species), Hypholoma (6 species), Pluteus (6 species), Inocybe (6 species), Conocybe (4 species), Panaeolina (4 species), Gerronema (2 species) and Agrocybe, Galerina and Mycena (each with one species), although in several species of this group, mainly in the Panaeoloideous fungi, there are no known chemical studies. In the second group are Amanita muscaria, A. pantherina and A. regalis; in the third group are Claviceps purpurea and allies: 5 species of Claviceps and 2 of Cordyceps; in the fourth group are bolets (two genera with 8 species), Russula (6 species), and 6 species of gasteromycetes (Lycoperdales y Phallales) in 3 genera. Concerning the distribution of Psilocybe, the majority of the species are found in or near the Austral hemisphere, mainly in the subtropical humid forests. Within these forests reside the most most well documented ethnic groups that use neurotropic fungi, such as the native peoples of Mexico and New Guinea. Mexico has the highest number of neurotropic species of fungi, with 76 species, of which 44 belong to Psilocybe (39 % of the world). More than 450 bibliographic references were considered. Mushrooms containing psilocybin have been used for millennia in primative societies for religious/medical purposes. However, today these fungi are used in Western countries primarily as a form of recreation. Although this use does not seem to be causing significant health problems, more study is needed to evaluate the significance of this phenomenon. Essentially all the ethnobotanical use of Psilocybe cubensis (Earle.) Sing. rests on the fact that it contains the compounds psilocybin and psilocin, both of which are hallucinogenic. The most complete interdisciplinary study of this and other “psilocybin” mushrooms is that of Heim and Wasson (1958). Singer (1958), Singer and Smith (1958), Pollock (1975, 1976), Ott (1976), Lincoff and Mitchel(1977), Ott and Bigwood (1978), Rumack and Salzman (1978), Schultes and Hofmann (1980) and Stamets (1978) have also published works on various aspects of hallucinogenic fungi. Because Psilocybe cubensis grows commonly in the southeastern United States and is easily cultivated (Stamets, 1978), it is probably the most commonly eaten hallucinogenic mushroom in this area today. The unauthorized possession, sale, or use of psilocybin or psilocin is a crime in the United States (Public Law 91-513) although few, if any, people have been convicted of possession of mushrooms. The purpose of this paper is to review the literature of man’s past and present use of psilocybin mushrooms, especially P. cubensis. The analysis of three bluing species of the genera Psilocybe, Gymnopilus and Conocybe from Germany revealed psilocybin and baeocystin and in some cases psilocin as well. The content of the alkaloids in cultured basidiocarps of Psilocybe semilanceata and Gymnopilus purpuratus was in the same order of magnitude as that found in naturally grown mushrooms. For the first time, the psilocybin containing non-bluing mycelium of Conocybe cyanopus could be cultivated. Ei suinkaan käsittele vain päihdyttäviä sieniä: Dokkarin parrasvalot osoittavat Telluriden sienifestivaalin suuntaan. Mutta Telluriden kävijöiden joukossa on paljon psykonautteja (ja nykyään on joka vuosi MAPS:n edustaja luennoimassa), joten madonlakit ja kärpässienet saavat nekin runsaasti mainintoja osakseen. Aeruginascin is a natural product from the hallucinogenic mushroom Inocybe aeruginascens. This compound was isolated and identified as 4-phosphoryloxy-N,N,N-trimethyltryptamine. Aeruginascin is the quaternary trimethylammonium analog of the hallucinogenic compound psilocybin. Synthetic aeruginascin was identical in all aspects to the isolated sample. Additionally, the mushroom alkaloids norbaeocystin and baeocystin were synthesized and a new synthetic approach to 4‑hydroxy-tryptamines was investigated. In a related project the influence of N-terminal substituents of tryptamines on serotonin receptor binding was studied. A series of tryptamines carrying a broad range of structurally diverse amino-substituents was synthesized. Most compounds had binding affinities in the nanomolar range for the 5‑HT1A, the 5‑HT2A, and the 5‑HT2C receptor. In functional 5‑HT2A IP accumulation assays most ligands acted as antagonists or partial agonists. Several compounds had biphasic dose-response curves. Sometimes the response at higher concentrations exceeded even that of the natural agonist serotonin. As shown by additional experiments, this effect was probably caused by non-competitive positive allosteric modulation of the 5‑HT2A receptor at higher concentrations. These results indicate a new independent regulatory binding site of the 5‑HT2A receptor. In contrast to a previous publication, in our hands the lead compound N‑(4‑bromobenzyl)-5‑methoxytryptamine was a low-affinity antagonist at the 5‑HT2A receptor. Carlos Castaneda: Don Juanin Opetukset, Toinen Todellisuus ja Matka Ixtlaniin ovat kirjoja joissa antropologi Castaneda kuvaa omia kokemuksiaan meksikolaisen shamaanin oppilaana. Kirjoissaan Castaneda kuvaa psykedeelien, kuten Psilocybe Mexicanan ja Peyotekaktuksen vaikutuksia ja sitä miten shamaaniopettaja Don Juan käyttää sieniä välineenä tuodakseen Castanedan lähemmäksi 'toista todellisutta' jossa ihminen Näkee katsomisen sijaan. Castaneda oli kyllä antropologian opiskelija ja toimitti lopputyönään kirjasarjansa, mutta sittemmin tarkkojen selvitystöiden tuloksena (lähinnä Richard de Millen toimesta) on paljastettu, että kirjat eivät perustu tositapahtumiin edes löyhälti, vaan ne ovat täysin sepitettyjä. Tämä sotii antropologin ammattietikettiä vastaan. Tapa käsitellä aiheita on täysin epäkunnioittava alkuperäiskulttuureja kohtaan, eivätkä ne anna todenmukaista kuvaa intiaanien meiningeistä. Kirjat sisältävät paljon asiavirheitä ja ristiriitaisuuksia, eikä niiden perusteella pitäisi muodostaa käsityksiään etnobotaniikasta ja/tai -mykologiasta. Mun mielestä kirjat pitävät sisällään tosi hyvää huumoria ja ovat hersyvällä tavalla elämänmyönteisiä. Ei niitä ehkä liian vakavasti tarvitse ottaa. Hyvää hömppää kuitenkin, mistä löytää paljon hyviä elämänasenteita, kun ei turhan ahdasmielisesti ajattele. Keksittyjä ne taitavat olla. Mun lukunautintoa se ei häiritse. Usein tuntuu käyvän niin, että Castanedaa joko parjataan tieteellisin perustein tai sitten kirjojen mystiikkaan uskotaan enemmän tai vähemmän fanaattisesti. Muitakin vaihtoehtoja on.